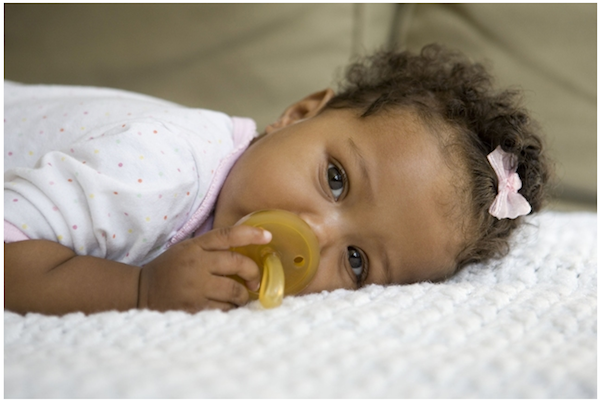 I began parenthood vowing there was no way I’d ever give my baby a dummy, I was positive that I would not budge on this fact. Until one night, about 3am when I gave my screaming four-week-old a dummy thermometer (I was sure she was sick) and then I heard it; silence. I’m not sure why I didn’t want to go there, I suppose I just hadn’t seen any dummies that I was sure of. Natursutten organic dummies would have given me the assurance I needed. We have showed you these awesome little inventions before so we just had to let you know there are some new ones on the market. They come with a few extra guarantees that not many of the other available dummies have. For one thing the whole dummy is made from one piece of natural rubber so there are no bits that can come off and no little crevices for bacteria to hang out in. Made from pure natural rubber from the tree Hevea Brasiliensi, the protein linked with latex allergies has been removed. They are also sustainable, free of artificial colours, hormone disturbing substances, chemical softeners, parabens, PVC and phthalates. You can pick them up from Eco Child for $9.96 each, but it may be a good idea to grab a few. As they are a natural product they need to be replaced every month or so, the rubber will naturally start to change colour to let you know when it is time.